Join a team / help wanted! As Pokitto is super small.Ideal for travelling.Also ideal as learning tool for kids.What about self-build dictionary? I’m not entirely sold on the dictionary idea (perhaps because the details are a bit vague), but certainly there would be some good educational uses for the Pokitto. A maths-oriented game is a good idea. When I was in primary school they got us to play a game that involved solving maths problems. I couldn’t remember what it was called but some searching lead me to find that it was “OutNumbered!”. It was basically a 90s point & click with a maths theme (gameplay video here). Pharab&Jonne- Have you played WORD RESCUE (msdos)? Neither of us will be notified if you don’t put a ‘@’ before the name (or spell the name correctly). Have you played WORD RESCUE (msdos)? No I haven’t, but I’ll watch the video. The old-style DOS graphics are amusing. The gameplay is quite an interesting idea. Yeah, there’s definitely oportunity for it. Quite easy to program too, so games like that would be good for beginners to make (even if the games aren’t particularly ‘cool’). 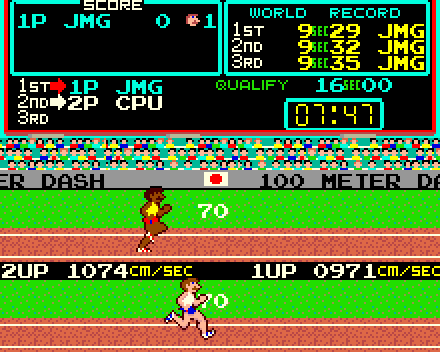 @Matej & @Pharap : how about Math&Field a math based version of the Konami / NES Track & Field game? We could have a question popping up, then a quick multiple choice answer will jump over hurdle / increase javelin power etc? Strange idea, but it could work. I will clean sprites during weekend!I like it!